Scanner cleaning is something you should learn immediately if you are a beginner. 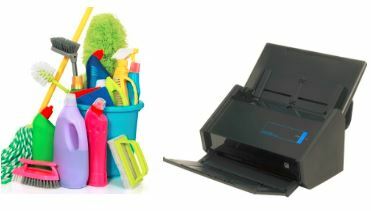 Basically, 50% of the high quality or poor quality of scans is down to how clean your scanning equipment is. The productivity of the scanning process can also be affected. You have to stop the scanning process everytime you see a streak. Don’t use the streak filters scanners provide, they will just distort your image. Just try and do your best with the cleaning. You will have to focus on 3 main things. The first one is the rubber rollers of the scanners. They handle the transport of the paper. The second part you need to clean is the paper path. A clean paper path means less dirt is transported onto the rollers and the glass. The third one will be the scanning glass. This is what the cameras use to capture the images. 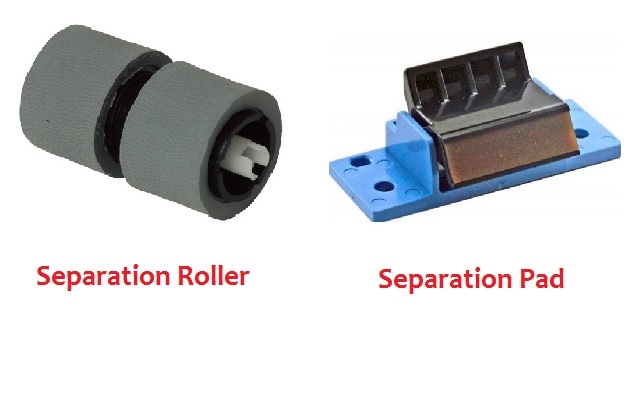 Pick rollers and brake rollers are the parts that transport the paper. On some scanners you will also have a separation roller or separation pad. 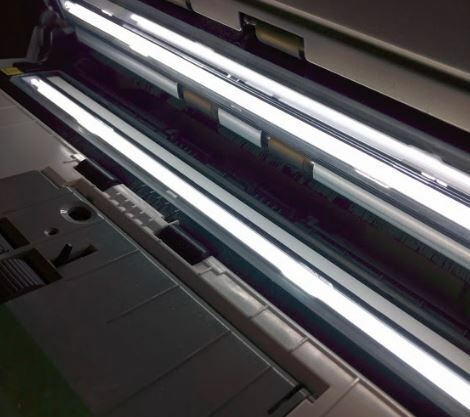 If you got 3 sets of rollers in your scanner, it means you have a separation roller. If you only have 2 sets it means you have a separation pad. As you can see in the photo above, depending on your scanner you should have one of those two plus the pick and brake roller. At the end of each paragraph, we will put a link to the products you need for cleaning. In the above photo, you can see how to clean rollers. 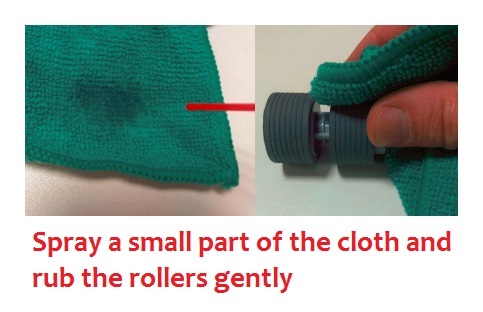 Spray some solution onto the cloth and gently wipe each roller. Be careful not to damage the rubber but don’t go too soft either. Do this for the pick rollers, the brake rollers and the separation rollers or pad. Once these are clean, put them aside and go to the next part. You can find a review about them by going to our page on the best alternative to the Fujitsu F1 Cleaner. This is very important to clean. If you don’t do this, it doesn’t matter how clean rollers and the glass are. All the dust and dirt will be carried inside the scanners and you will have streaks on scans in no time. As you can see in the picture above, the paper path is nothing more than plastics that revolve around the scanning path. 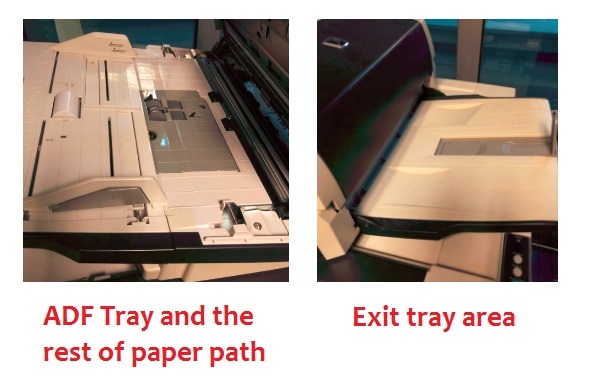 From the place the paper starts to move, the ADF tray to the exit of the scanner and even exit tray. Vacuuming – Vacuum the entire entrance area and maybe even around it. That is the ADF input tray plus an area where there are small or larger holes. Go to the camera area and also the same there. Then head to the exit tray area and vacuum over there. Cleaning with anti-static fluid – Spray anti-static fluid on a piece of cloth. You can use the same type of cloth as you use for rollers. But please make sure you use a different one. Clean well the same areas you vacuumed. After this, the scanner should have a fresh look. Before you do this we recommend you reinsert the rubber rollers in their places. Inserting them now means you won’t accidentally rub your hand on the scanning glass after you have cleaned it. It will make the process more successful trust us. Now that you have reinserted the rollers let’s get to the actual cleaning of the glass. Spray some glass cleaning solution on a microfiber piece of cloth. Again, we will link them below to know what to buy for this. As you can see in the image, just rub the microfiber cloth gently on the glass. Move the sprayed cloth gently, down the length of the scanning glass. Use a light source to check for stuck dirt or lint. If you can see none, you are good to go. If you still have quality issues after the cleaning, recheck and make sure your scanner does not have scratches on the scanning glass. Always make sure you have the consumables needed. You don’t have to buy OEM cleaning consumables but research before you buy something. Also, invest in air blowers or vacuum machines if you think you will be doing a lot of scanning. It will be worth it. Please remember that when you clean the scanner also do minimal technical checks. Especially check if the glass might be scratched. In such case replace it. Or if you only scan office documents you might get away with it. If you want to know more information about a new scanner we have a full review of the Fujitsu FI 7160. What’s it like to scan photos with the Fujitsu FI 7160 and what’s it like to scan documents with the FI 7160. These reviews are very good if you are thinking of replacing your current scanner.